First developed in 2001, the Rio Scale is a tool used by astronomers searching for extraterrestrial intelligence (ETI) to help communicate to the public 'how excited' they should be about what has been observed. The Scale measures the consequences for humans if the signal is from aliens, as well as the probability that the signal really is from aliens, and not a natural phenomenon or human-made. The scale gives a score between zero and ten, so that the public can quickly see how important a signal really is. "The whole world knows about the Richter Scale for quantifying the severity of an earthquake; that number is reported immediately following a quake and subsequently refined as more data are consolidated," said Jill Tarter, co-founder of the SETI Institute. "The SETI community is attempting to create a scale that can accompany reports of any claims of the detection of extraterrestrial intelligence and be refined over time as more data become available. This scale should convey both the significance and credibility of the claimed detection. Rio 2.0 is an attempt to update the scale to make it more useful and compatible with current modes of information dissemination, as well as providing means for the public to become familiar with the scale." There have been many dubious signals reported as 'aliens' in recent years, and learning the truth about these stories is increasingly difficult. As such, an updated Rio Scale is required. The new study, led by Dr. Duncan Forgan at the University's Centre for Exoplanet Science, highlights the changing nature of news media, the growth of 24-hour news and the new landscape of social media. Coupled with an increase in efforts to detect ETI by teams around the world, the Rio Scale is needed more than ever, and it must remain relevant when communicating to the public about 'alien signals'. The international team of researchers' revision of the Rio Scale (Rio 2.0) aims to bring consensus across academic disciplines, when classifying signals potentially indicating the existence of advanced extraterrestrial life. Rio 2.0 can quickly calibrate the public expectations of a reported signal, and educate them as to how SETI scientists actually evaluate a signal, from its initial detection through the various verification stages needed to determine if a signal is credibly from ETI. Lead researcher, Dr. Duncan Forgan, Centre for Exoplanet Science, University of St Andrews, said: "It's absolutely crucial that when we talk about something so hugely significant as the discovery of intelligent life beyond the Earth, we do it clearly and carefully. Having Rio 2.0 allows us to rank a signal quickly in a way that the general public can easily understand, and helps us keep their trust in a world filled with fake news." There should be another category at the bottom: 'Not Even Wrong'. I think that Rio 2.0 is a great idea. The Universe, being a big place, and with millions of star/planetary systems older than our own Solar System, it would be a sign of self-centeredness and egotism to even THINK that humans have to be and must be the only sentient/intelligent Life Forms in existence. Out of the supposed 13.8Billion (cosmic or Earth years?) it would be the belief of a simpleton to say that WE ARE ALONE. The odds are against being alone in the great, vast Universe. I would welcome an Extraterrestrial to Earth, as long as he has no intention of having me for his dinner. If signals were detected that would be extremely old and the civilization that sent them may be long gone. Saying that, civilizations advanced enough for travel outside their solar systems would have to have faster than light communication technology. Possibly using quantum entanglement as it's bases. I think once we look at other forms of communication we may detect some type of signals, hope so anyway. Not a scientist as you can see. I am a writer and browse through this forum for ideas for my stories. What a waste of resources, SETI and such silly classification tables. 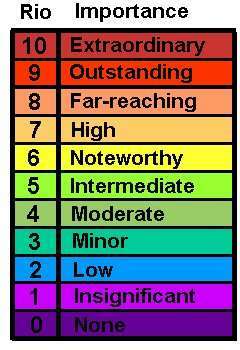 Here the revised version of Rio scale: level O – No Importance. It is old news that we are not alone, see for example: https://www.amazo...mp;psc=1 All what lacks is us waking up and beginning to develop deep respect for each other, all life on Earth, the planet itself and anything beyond it, and behave accordingly for a brighter future.